Indeed, a search online shows that Ebay is selling the same item at the same price, …by a single seller ….Langley’s! The only apparent competition is from Amazon, where an upstart seller, “rockstrapuk”, is offering the whopping price of £74.99 + £3.99 delivery (with only 1 left in stock). Is Langley’s abusing its monopoly position? Is steadfastly charging £34.99 an exploitative price? As a potential comparator good, the standard (London) Monopoly set currently costs £14.49 from Amazon. Amazon are bragging that this is a special offer price, discounted from the RRP of £21.99. 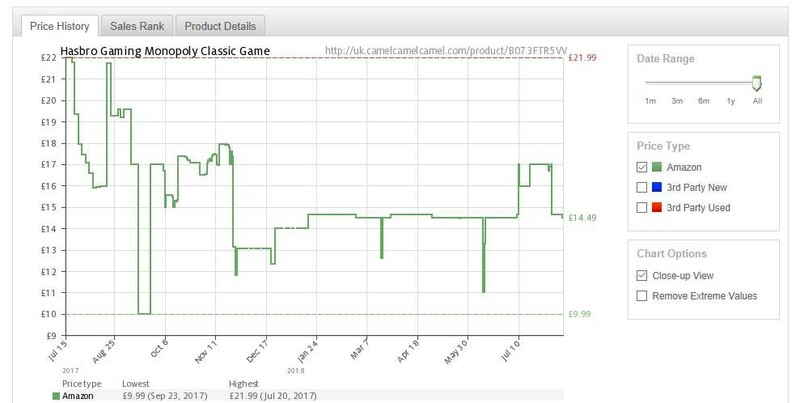 However, as the following pricing chart from CamelCamelCamel shows, Amazon’s price fluctuates regularly, and you could have snagged a better bargain at £9.99 last September – if you were smart enough to use a price checker service and be patient! Is London Monopoly a good substitute for Norwich Monopoly? Probably not. Is Norwich Monopoly in a monopoly market? Probably. What would a SSNIP test reveal? 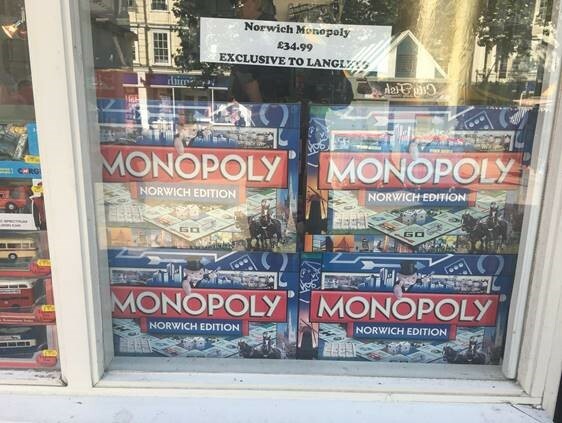 Unfortunately, the lack of price fluctuation away from £34.99 and the risk of the cellophane fallacy means there is no definitive empirical evidence, but given the very limited and completely local demand for Norwich Monopoly, it could even be a natural monopoly. One final possibility. Is Langley’s a benevolent monopolist? Is it a wonderful independent shop fighting to survive in a world dominated by multinational retail giants, and giving us a unique and special board game at a reasonable and fair price that would not otherwise exist in the market? I would like to think so and if you agree then you might want to grab a set while stocks last…!! This entry was posted on Thursday, August 16th, 2018 at 1:30 pm and is filed under Dominant Firms, General. You can follow any responses to this entry through the RSS 2.0 feed. You can leave a response, or trackback from your own site.